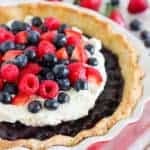 The BEST Blueberry Pie Recipe – A beautiful red, white and blue summer pie. A buttery pie crust filled with fresh blueberries and topped with whipped cream and mixed berries. 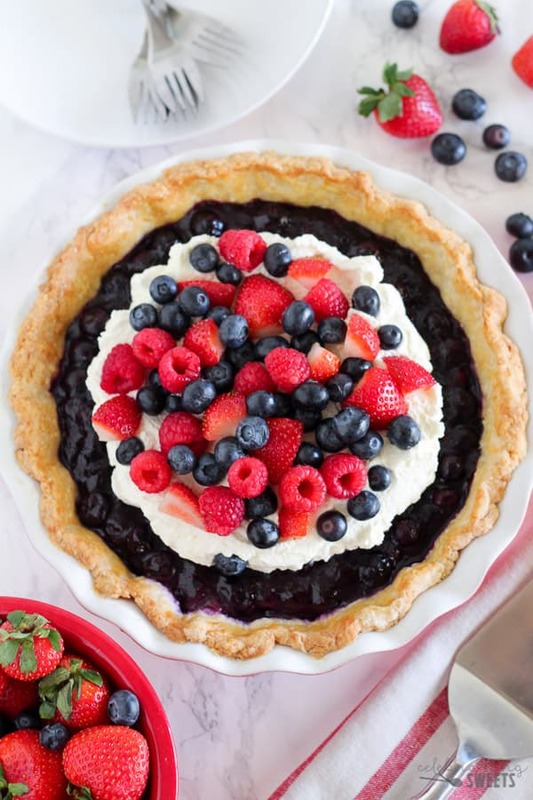 It’s time for you to make a beautiful berry-filled summer pie, and this one just happens to be red, white, and blue, and the 4th of July just happens to be right around the corner. Coincidence? I think not. Let’s make pie! What we have here is a buttery homemade pie crust, a thick filling of sweet blueberries, a mountain of freshly whipped cream, and a scattering of mixed berries. Isn’t it a beauty? Pie is a labor of love; there’s no hiding that. I’m not going to tell you that this recipe is super fast and easy, but, I will tell you that you can totally do this. The most time consuming part is making the crust; the filling and topping are super simple. If you’ve been around here for a while you know that I love pie. Lemon Cream Pie, Strawberry Pie, Coconut Cream Pie – I just can’t get enough. And now it’s time for the best Blueberry Pie Recipe! For me, there’s something special about making a pie crust from scratch. It involves patience, a little love, and getting your hands dirty. If you’ve never made a pie crust before, now is the time to start. Even if you kinda-sorta screw up this pie crust, there’s still a very good chance it will be better than a store bought crust. If you absolutely have to use a store bought crust, just please, please, please take a look at the ingredients list and try to avoid the kind with hydrogenated oils. That’s some yucky stuff that has no place in our beautiful pie. If you have your own homemade pie crust recipe feel free to use that in place of mine. The pie crust will be blind baked for this recipe. We’re going to bake it on it’s own without the filling it. While the pie crust is baking, we prepare the quick blueberry filling on the stovetop. Once the pie crust is baked, then we add the blueberry filling. 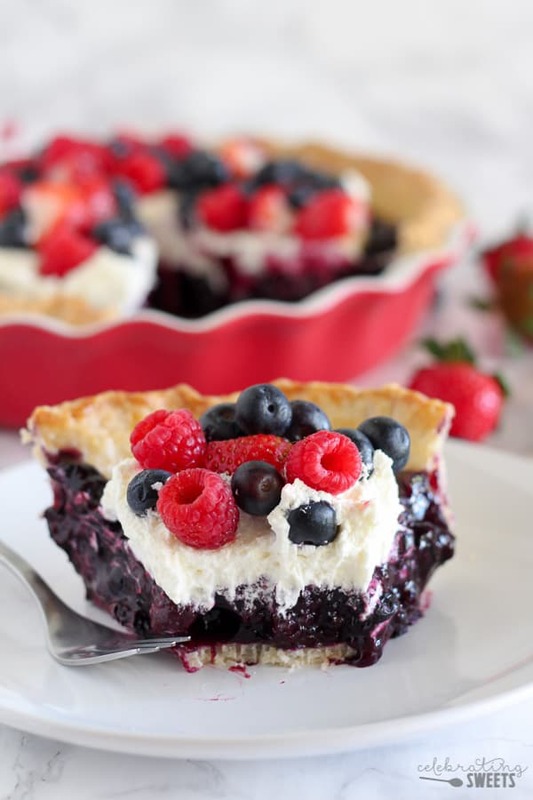 After chilling, the blueberry pie is topped with freshly whipped cream and a mountain of fresh berries. 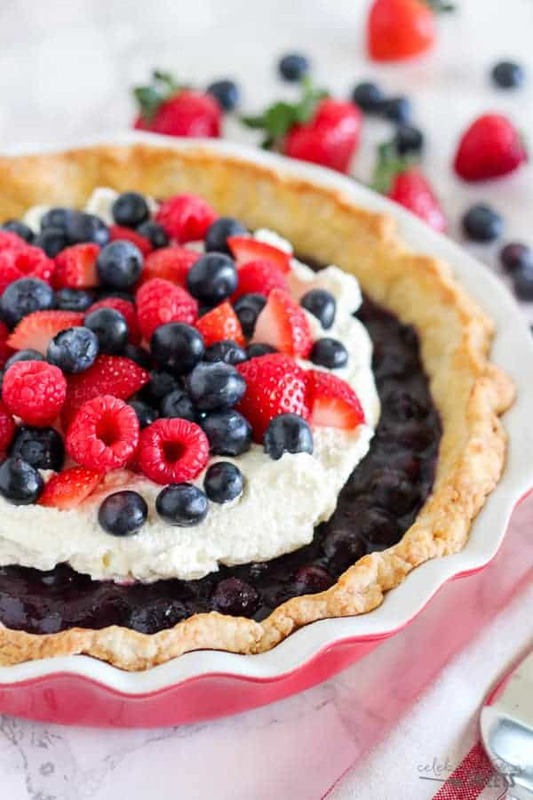 I used a mixture of berries for the topping to go with a red, white, and blue theme, but you could skip the red berries and just add fresh blueberries to the top. I love the contrast of the fresh berries on top with the cooked berries on the inside. It’s SO good! Get out that apron, dust your countertop with flour, and let’s do this. It’s pie time! Love blueberries? Try my BLUEBERRY SAUCE – it’s great on cake, cheesecake, pancakes, ice cream and more! 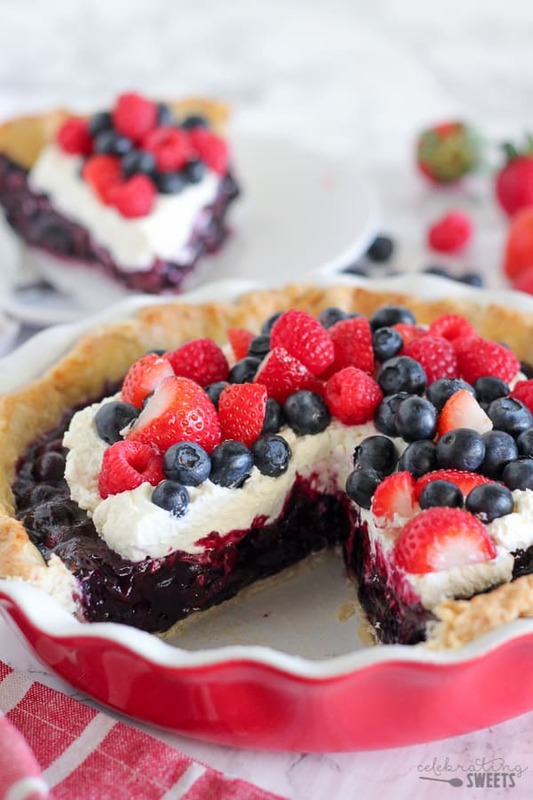 A beautiful red, white and blue summer pie. A buttery pie crust filled with fresh blueberries and topped with whipped cream and mixed berries. In a large bowl, combine flour, sugar and salt. Add butter, and using a pastry blender or your fingertips work the butter into the flour until the pieces of butter are pea sized or smaller. Sprinkle in 2 tablespoons of ice water and stir to combine, trying to work the dough as little as possible. If the dough still seems dry add another tablespoon of water and mix until a dough has formed. Form dough into a disc and cover in plastic wrap. Refrigerate for 45 minutes. On a lightly floured surface, roll out dough into an approximately 12-inch circle. Transfer the dough into a 9 1/2 inch pie dish and crimp or fold the edges. 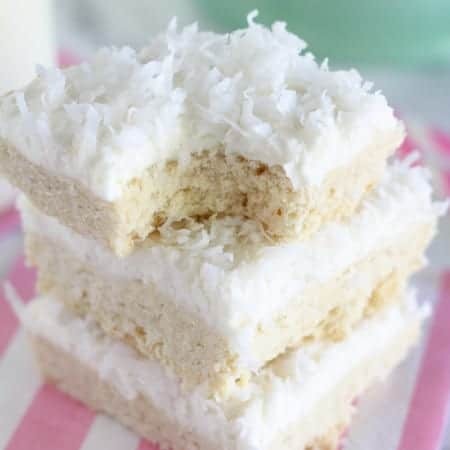 Place in the freezer for 10 minutes. Preheat oven to 375°F. Line the crust with parchment paper and fill with pie weights or dried beans. Bake for 25 minutes. Remove the parchment and pie weights from the crust and brush the crust lightly with beaten egg (this will prevent the crust from getting soggy after the blueberries are added). Return the crust to the oven (without the parchment or weights) and bake for an additional 5 minutes. At this point the crust should be completely cooked and golden brown. Set aside to cool. Reserve 1/2 cup blueberries for topping, set aside. In a medium saucepan over medium-high heat, combine the orange juice, sugar, lemon zest, and salt, stirring, until the mixture comes to a boil and the sugar has dissolved. Add the remaining 5 1/2 cups blueberries. Stir in the cornstarch and bring to a low boil. Stir constantly, gently mashing some the berries with the back of a spoon until broken down and thickened about 2 minutes. Remove from heat and cool slightly. Spoon the filling into the pie crust and refrigerate until set, at least 4 hours or up to 1 day. 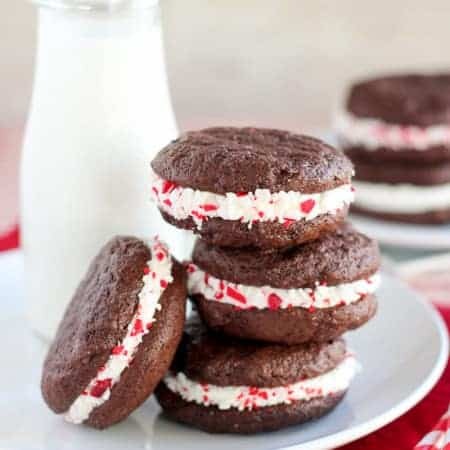 Right before serving: Using a hand mixer or stand mixer, whip heavy cream, powdered sugar and vanilla until soft peaks form. Spread the whipped cream onto the center of the pie, leaving a 1 inch border around the outside. 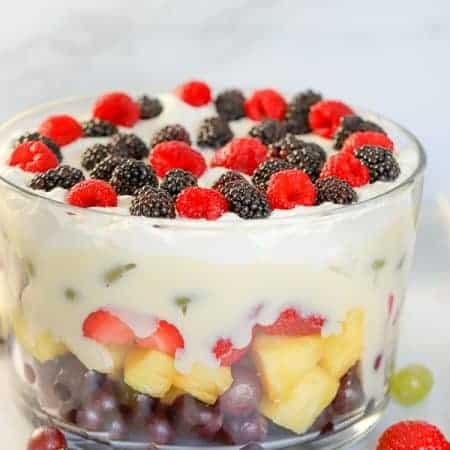 Top with fresh berries. Serve immediately. This pie looks divine! The epitome of summer sweets! Your photos are amazing! This looks amazing! I’d really love to try this. This looks SO GOOD! 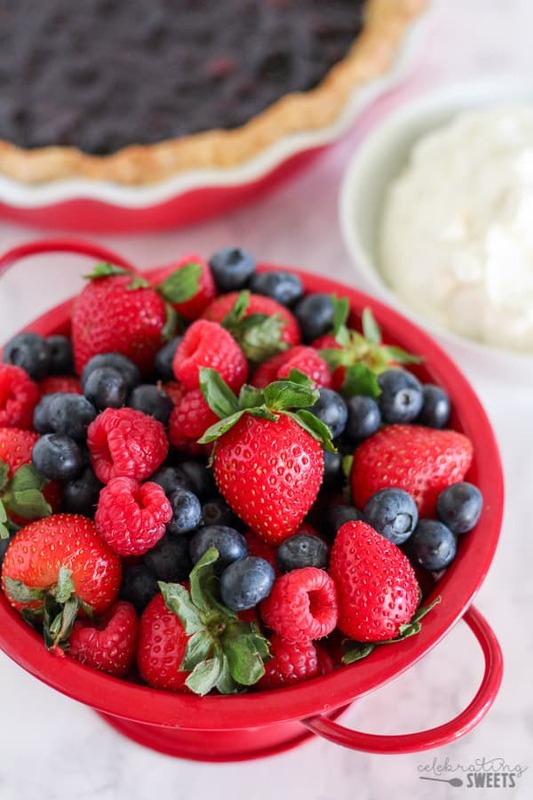 I love this kind of dessert for the summer – and it’s perfect for the 4th of July too! Yummy! This “labor of love” is stunning! I love how deep it is – all the more to savor in each decadent forkful! OK. Now, I need to hit the local farmer’s market and stock up on my berries. This looks divine! Is there anything more perfect for summer? This looks fabulous! I wish I had a slice right now.